One of the guns at Kvarven in restored condition. * In addition to this a torpedo battery was also built on the shoreline of Kvarven. On the 8th April 1940, 279 soldiers and 33 officers were manning the fort, theiraverage age was 40 . There were no reserves, and some of the men had to endure 3 day watches before they were relieved. The military training was insufficient, and the fort had no units prepared for close defence. The crew at Kvarven fort waited for their invaders to come, but they did not show up at the calculated time. The Germans where actually busy transferring infantry to smaller landing craft, to attack Kvarven from the West side, later on, the ships would disembark more infantry on the East side of the fort, and completely surround it. * After some confusion the order to open fire came at 03:58. 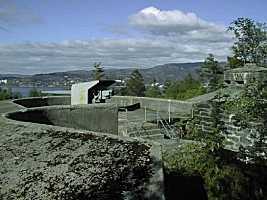 A light fog prevented the proper use of range finders, and the searchlights on Kvarven were useless due to the total blackout and cut in electricity in Bergen just hours before. The searchlights where actually powered by the civil power grid! 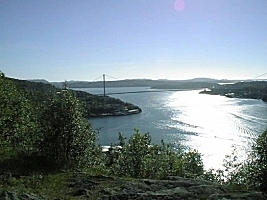 The range to the enemy warships had to be vaguely estimated, and caused inaccuracy, so the batteries at Kvarven were only able to fire two salvoes at the cruiser "Köln" and the two torpedo boats "Leopard" and "Wolf" before the ships reached the forts dead zone, about 1500m from the fort. 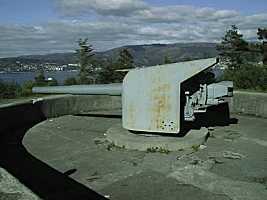 Within this range the guns could not fire directly at the ships. One single Norwegian F.52 aircraft dropped two bombs on the ships, but missed. The fort was aiming so badly that the Germans thought they were warning shots, and did not return the fire. Finally the fort managed to get two hits on "Bremse", and one on "Karl Peters" They did not sink, but were unable to fight on. At 04:43 "Königsberg" was speeding into the harbour at 22 knots. By a mistake the howitzers on Kvarven did not fire, and the 21 cm guns missed on the first two salvoes. The third salvo hit "Königsberg" right under the waterline, and started a fire, the fourth salvo hit the deck, and the fifth salvo hit right under the conning tower. The guns on Königsberg were now returning fire and set one of the 21 cm guns out of action. 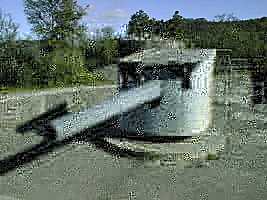 Shortly after, the two other 21 cm guns broke down due to technical problems. At 05:01 Willoch gave the order to cease fire, and the battle was over for Kvarven. Kønigsberg from another angle. Far behind you can see the mountain where Kvarven fort is situated. Königsberg managed after a lot of struggle to anchor before it hit the cliffs at Oldernes. (Königsberg was sunk because of heavy damage inflicted on her by British aircraft the next day.) Hellen fort was now ready to pound her guns at the warships, and fired several shots at "Köln". The range had to be estimated from this fort too. All shots missed, and two of the three guns broke down due to technical problems, the last gun received the order to cease firing just as it was beginning to range in on the ships, now clearly visible. The order came as a result of a misunderstanding, and nearly two hours later the fort was again given the order to continue firing! None of the shells from Hellen found its target, and Hellen was shortly after brought to silence by six German bombers. The torpedoes at the torpedo battery were missing their fuses and gyroscopes, and could not be used. The Norwegian torpedo boat "Brand" was hiding in Gravdalsbukten near the east side of Kvarven. The range to the German Warships was 700-1000 meters, and one or several hits would have been assured, still the commander chose to abandon his ship because he felt that the chance of success was so minimal that he would not risk it! The Germans captured his ship intact. Meanwhile the infantry disembarked on the West and East side of Kvarven and were able to take Kvarven fort. Germans, when failing to stop when ordered as he tried to reach his post at the torpedo batteries. 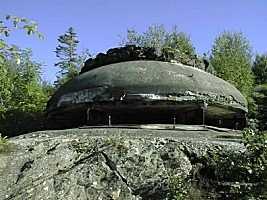 One have to include that the failure and mistakes which occured at Kvarven fort, came as a result of little or no training, fresh and "green" gun crews, and old equipment. The commandant Willoch probably did the best he could, considering the limited resources he had at his disposal. You can clearly see how this gun was placed on a forward facing slope, to make it harder for the invaders to hit their mark. In the foreground, you can see an anti-aircraft gun emplacement, and on the right side, behind the gun, a well armoured command post.